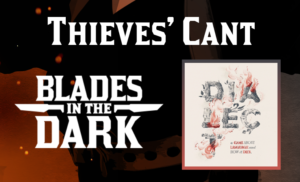 Our second and final episode of Thieves’ Cant. We picked up from the first session (where we played Dialect) and continued the story with Blade in the Dark. Playing the Grey Cloaks (for reals this time) we saw one of their early scores on the docks as they were still trying to find their footing in the Doskvol underworld. Usa Waydrind – A petite Severosi ex-soldier who thought she could use her skills to better ends on the streets of Doskvol. Aiz Anserekh– A disgraced Iruvian noble who still keeps him mustache perfectly groomed despite other effects falling by the wayside. When he arrived in Doskvol he joined the Bluecoats (and gained many scars in the process), which he left alongside Nessa and Hutch. Prep, what is this thing? What is it doing in Blades in the Dark? Well, I knew we had two hours to game and I wanted to make sure we weren’t spending all of it just figuring out what score to go on (very easy to do). I also wanted to make sure that the Grey Cloaks were surrounded by people at all times, so they would need to use their cant to communicate if they didn’t want others to overhear them. Chief Helker runs the docks. From his warehouse office perch he can see across nearly all of them and with a constant stream of reports from his clerks as well as other informants, he keeps pace with the hundreds or thousands of transactions that happen daily at the docks. Diamond, a tough old wold who hires day laborers to fill in and do the work that the union dockers don’t want to do. Lord Strangford‘s leviathan hunter, the Nightbreaker, is in dock getting repaired from it’s last hunt. A bevy of Bluecoats and dockers alike stand around near the boat doing security and making sure only the right people make it on board. Eager to abuse his power whenever he could the rough Bluecoat Needle paraded around the docks as though he owned the place (which wasn’t entirely untrue). The Red Sashes, disappointed with their share of the extortion rackets the Crows allocated them had sent members to fleece merchants on their way off the docs. If they could get to them before they paid their bribes to the Crows or the Lampblacks, they cold cut in on the action. And if someone was foolish enough to pay them, they got what they deserved. Zora Hakar, a Red Sash who is dangerous but looks authoritative enough to get people to cough up bribes, was on the dock, pilfering from whoever she could! Strangford’s Bluecoats were intentionally interrupting the transport of leviathan blood, and blaming everyone else for their delays, so that they could sneak it into a warehouse and dilute it. The Nightbreaker didn’t bring enough to make it’s quota, so they were covering up for it. Needle as in charge of keeping this operation secure. The Grinders, eager to derail imperial supremacy have a plan to get on-board the Nightbreaker as “workers” and sabotage the repair operation, while also trying to rob from it’s coffers if they get a chance. Derret, tough, smart, and willing to take risks, got in line with the other day laborers to get himself work so that he could get close to the Hunter and find out how to get his crew on board. I figured with four accessible characters (Diamond, Needle, Zora, and Derret), each representing larger forces (Dockers, Strangford, Red Sashes, and Grinders respectively) we’d have plenty of opportunities to interrupt other scores or plan one of their own! In short things went well for Aiz and Usa (they made off with Zora’s take) and very poorly with Vond (he was last seen entering a boat house and Needle following after him. Gunshots were heard, Needled walked out and Vond didn’t). We used our cant, it was so cool. Derret was trying to figure it out and didn’t get it. Needle knew what it all meant but wasn’t close enough to overheard. I loved it. This group was great, they honed in on place they could rob the robbers and went to town. I love that it ended in a duel. Poor Vond. I wonder if it was bugskot for him or if he made it. Having the prep for a short game like this was definitely helpful. It’s not my style normally, but I was glad that we had lots of low hanging fruit to pick from. Oh, several things, some more important than others. I thought it was novel and fun to have the scoundrels take actions just to get day work, and it did offer a lot of opportunities for me to reveal the setting to them through complications. I just felt bad that we spent the first hour with them just trying to earn a few slugs for carrying boxes. It was about the lowest stakes I’ve ever seen in Blades and I was concerned both for the players and the the audience that patience for it might have been wearing thin. At the end, because we were well over time, I asked them to wrap everything up with fortune rolls and then that determined the outcome. The trick there as that when I assigned consequences to the results, chat (correctly) suggested that they could resist those consequences. Which normally would be totally true but I wanted these fortune rolls to reflect the sum total of all the actions. It didn’t matter that much in the end but I think that when doing one roll resolution, I may elect not to allow resistance rolls and abide just by what the fortune roll tells us. Someone said something offensive in chat, which I wish I just deleted, but I was caught off guard enough that I just said it out loud. This was clearly the case of me needing to hone my chat moderation skills and not be as quick to blurt out something I read. We were pretty quick to move past it. Next time hopefully I’ll catch it before I open my mouth!